We love cooking shrimp because it pairs well with anything, cooks quickly and takes on whatever flavor you want to add to it with ease. We also love making skewers as a fun option for grilling in the summer. For this recipe we made a flavorful paste full of cilantro, garlic, lime and chili powder to smear on the shrimp before grilling them up to perfection. The result was an easy meal when we threw some fresh pineapple, mushrooms and onion on the skewers as well to grill up at the same time. 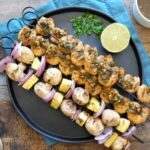 Make up a big batch of these cilantro garlic shrimp skewers, you will want to eat every last one. You’ll just have to get your shrimp ready by peeling off the shells and giving them a quick rinse. If you don’t buy pre-deveined shrimp, you’ll have to do that as well (we bought ours already deveined). After that, mix up your paste and get your skewers ready to throw on the hot grill. These only take a few minutes to cook, so you’ll be devouring them in no time. If you don’t have the time to do these on the BBQ, they will cook up just fine in about the same amount of time in a hot skillet. If you try out this recipe, let us know what you think by leaving a comment below and adding your rating. Also, take a picture and tag it on Instagram #realsimplegood so we can check it out! 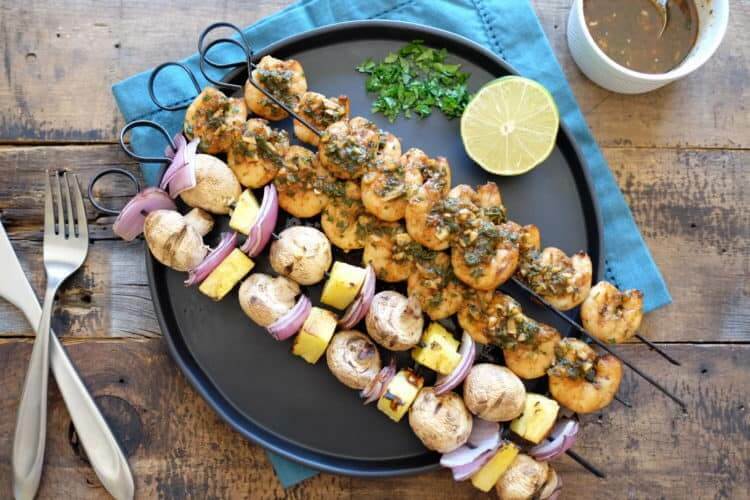 Enjoy the great cilantro garlic flavor of these shrimp skewers! Start your BBQ to get it good and hot. Peel your shrimp and give them a quick rinse under cold water. Set aside while you prepare the paste. In a medium bowl, combine garlic, cilantro, chili powder and lime juice. Mix it together, it should be pretty thick. Add in some coconut aminos, just enough to make a good paste that can be smeared on the shrimp. Add your shrimp to the bowl and mix everything together to give the shrimp a good coating with the paste. Put your shrimp on the skewers and it is ready to grill. Grill the shrimp for about 3 minutes each side, until it is cooked through. Since I am avoiding nightshades, do you have any recommendations for replacing the chili powder with another ingredient/spice? You could try cumin in place of the chili powder. Let us know how it goes!